Sometimes the “subtext” in Denial is so on-the-nose that you have to watch the film cross-eyed. Director Mick Jackson’s courtroom-drama feels like a Disney film for adults. The heroes are one-dimensionally heroic, the villains are one-dimensionally villainous, the cinematography is bright and colorful and the soundtrack is as whimsical as anything you heard in Bambi. Folks expecting Denial to be a thought-provoking investigation into the historicity of the Holocaust will be underwhelmed; however, I thoroughly enjoyed the film’s hammy ruminating about the differences between facts and feelings. Denial opens in 1996, when David Irving (Timothy Spall) sued historian Deborah Lipstadt (Rachel Weitz) for claims in one of her books that Irving was a Holocaust denier. Irving filed his lawsuit against Lipstadt in British courts because the burden of proof would be placed on Lipstadt, essentially forcing her to prove the Holocaust definitely happened. Just as Lipstadt refuses to debate Holocaust deniers and risk validating their arguments (her mantra is, “It’s the Holocaust. It happened.”), Denial somewhat sidesteps the actual debate to focus on friction that arises when bigots mistake their right to believe anything with anything they believe being right. 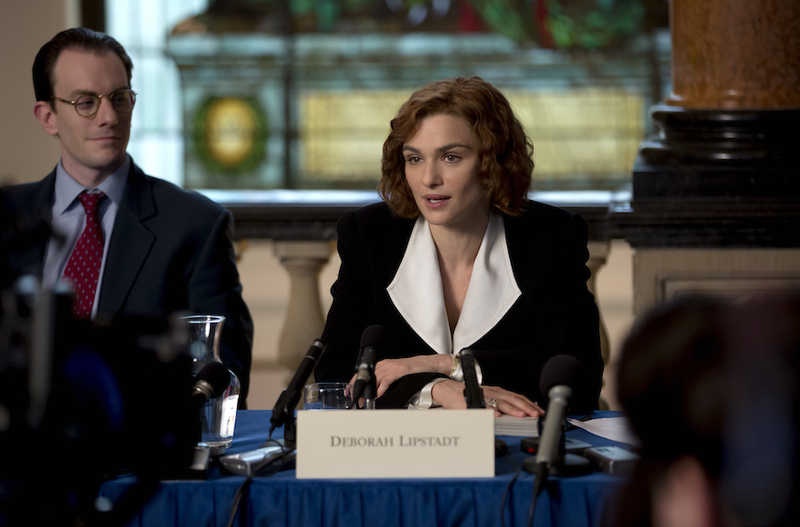 Tom Wilkinson and Andrew Scott are solid in supporting roles as two lawyers working Lipstadt’s case, but Denial is a showcase for Weitz and Spall. Both actors manage to sell gloriously cheesy dialogue comprising endless monologues, revering the importance of distinguishing perceptions from reality, with gusto to spare. Part of the fun is how plainly Spall’s Holocaust denying, white nationalist, “I’m not racist, but…” character resembles Donald Trump. Surely the GOP’s presidential nominee was already prominent by the time Denial was filming, and you can feel it in Irving’s characterization. Even his hair looks reminiscent of Trump’s signature coiffure. The problems with Denial were to be expected from its melodrama. The courtroom scenes are painfully procedural, a subplot about media hype throughout the legal battle goes nowhere and the inclusion of a catch-all Holocaust survivor character is a lazy attempt at making sure the victims’ voices are heard. Perhaps I had low expectations from the start of Denial, but I saw all of my issues with the film coming from miles away, yet they weren’t enough to kill my intrigue entirely. It would definitely be interesting to see a bit more serious film tackle the lawsuit between Irving and Lipstadt at some point. I was entertained enough by the standard-issue sappiness in Denial; however, it’s such an interesting case that I wish a more thoughtful film had been made. Denial’s two lead performances and unexpected relevance keep it afloat for a runtime that’s maybe a bit too long. Even if the film’s message is on-the-nose, at least it’s a message I can get behind.